When discussing with companies about Orange County Directors & Officers Liability Insurance, we are referencing a type of professional liability policy whose objective is to provide protection for past, present, and future company directors and officers of privately held firms, nonprofit companies, for-profit companies, and educational institutions from damages resulting from actual acts or alleged wrongful acts the organization’s directors and officers may have committed in their positions with the organization. The protection provided by this particular type of professional liability policy is in the event of any alleged or actual wrongful act, misleading statement given, breach of duty, or omission by your board of directors and officers. In effect, these types of professional liability policies act as management errors and omissions liability insurance covering claims which result from managerial decisions which have severe financial consequences affecting the company. When any company selects a board of directors, the right investment decision to make is to purchase an Orange County, CA Directors & Officers Liability Insurance Policy. If the company has investors, chances are very strong that one of the conditions the investors will insist upon when providing funding for your company will be that your company acquires an Orange County Directors & Officers Liability policy since the directors and officers can become the target of a lawsuit from shareholders, customers, employees, vendors, or regulatory agencies. We also want to be clear this type of coverage is NOT Errors & Omissions Liability Coverage. Sometimes clients do confuse Directors & Officers Liability Insurance with Errors & Omissions Liability Insurance. These two types of professional liability insurance coverages are not the same. An Orange County Errors & Omission policy is concerned with performance, negligence, and failures with respect to your company’s products and services, not with the duties and performance of your company’s management team. Companies such as accountants, business consultants, and insurance brokers carry this type of insurance coverage. We highly recommend to our clients that it would be beneficial for these types of companies to carry both Orange County, CA Directors & Officers Liability Insurance and Orange County, CA Errors and Omissions Liability Insurance. Having Orange County, CA Directors & Officers Liability Insurance coverage is extremely important for any company that has officers responsible to its board and/or its investors, especially if there’s any possibility that a lawsuit is able to breach the company veil and hit its executives personal assets. There is a general assumption that the officers of any corporation have a firm obligation of always acting in the best interests of the company and its customers. If an officer were to make a side bet against the company, his wrongful actions could expose the company to considerable risk. Having this type of professional liability insurance can provide coverage and can mitigate this risk. In effect, these professional liability policies function as “management errors and omissions liability insurance,” covering claims resulting from managerial decisions that have severe financial consequences for your company. It should be noted that some of the insurance companies can include, with separate or shared limits, Employment Practices Liability Insurance (wrongful termination, workplace harassment, discrimination, etc.) on Directors & Officers Liability policies for private companies. These professional liability policies contain provisions called shrinking limits, which means that defense costs, which are more times than not a major cost of the claim, are included in the policy limits and will reduce the policy limits. This approach contrasts with most commercial general liability policies in which defense costs are covered in addition to the policy limits. Other unique features of Directors & Officers policies are that they: (a) are written on a claims-made basis with a retro date, (b) may contain no explicit duty to defend the insureds (when covering for-profit businesses), and (c) cover monetary damages but exclude bodily injury (BI) and property damage (PD). 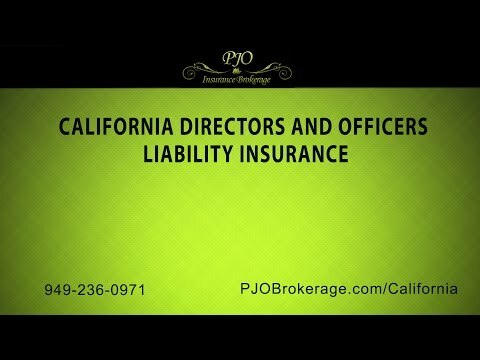 If your company would like to discuss how a Directors & Officers Liability Insurance Policy would serve your company, please call the professional insurance brokers at PJO Insurance Brokerage in California.